Bhaskar Chakravorti joined The Fletcher School at Tufts University in January 2011 as the Senior Associate Dean for International Business and Finance and Executive Director of Fletcher’sInstitute for Business in the Global Context(IBGC) andCouncilon Emerging Market Enterprises(CEME), a hub for emerging thinking on emerging markets. Bhaskar also serves on the Fletcher faculty as Professor of Practice in International Business. Prior to Fletcher, he was a Partner of McKinsey & Company and a Distinguished Scholar at MIT’s Legatum Center for Development and Entrepreneurship. He also served on the faculty of the Harvard Business School and the Harvard University Center for the Environment. He was a leader of McKinsey’s Innovation and Global Forces practices and served on the Firm’s Knowledge Services Committee, which oversees McKinsey’s 1,200 person global research network. Bhaskar has advised CEOs, Boards and senior management in multiple industries (high technology, health and consumer care and cleantech), policy makers and non-profits on innovation, growth and new business-building and strategies for emerging markets. In a 20+ year career as consultant and educator, he has advised over 30 companies in the Fortune 500, policy-makers, investors and entrepreneurs. His work has spanned multiple geographies: the Americas, EU, Asia and Africa. At Harvard, he taught innovation, entrepreneurship management, and new venture formation, co-chaired an immersion program to India, and published research on innovations triggered by adversity and crises. Bhaskar’s book,The Slow Pace of Fast Change: Bringing Innovations to Market in a Connected World, Harvard Business School Press; 2003 — selected as one of the Best Business Books of the year by multiple publications and an Amazon.com best-seller on Innovation —has been influential in many client and policy recommendations. He has written over 40 articles in top-tier peer-reviewed academic journals (e.g.Journal of Economic Theory, Journal of Mathematical Economics, Journal of Economics and Management Strategy, Games & Economic Behavior, International Economic Reviewand many others),multiple books, and widely-read publications, e.g.,Harvard Business Review, New York Times, Wall Street Journal, Financial Times, Economic Times. He has also published over a dozen HBS case studies, a video HBS Faculty Seminar and authored two websites on innovation and on public safety. Bhaskar’s work is featured in multiple media, e.g.,BusinessWeek, The Economist, Fortune, Wall Street Journal, BBC, Fast Company, Economic Times, CBS MarketWatch,as well as on television, podcasts and a documentary film. 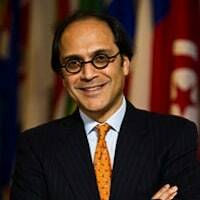 He has been invited to speak to audiences in business, academia, an advisory committee to the U.S. president, public policy-making bodies (e.g., FCC, Capitol Hill), multi-lateral entities (e.g., World Bank, ITU), futurist think-tanks (e.g., Aspen Institute, GBN), research, and the investor community. Bhaskar’s prior appointments include: Partner and Thought Leader at Monitor Group, the global strategy firm; game theorist and member of the technical staff at Bellcore (formerly, Bell Labs); assistant professor of economics at the University of Illinois at Urbana-Champaign; officer of TAS, the executive cadre for the Tata Group, India’s pre-eminent conglomerate. Bhaskar’s economics PhD is from the University of Rochester where he was a University Fellow. He is a graduate of the Delhi School of Economics and in economics with honors from Delhi’s St. Stephen’s College. Bhaskar and his wife, Gita, live in Brookline, MA with their two children, Tarit and Sahana, and two fairly agreeable cats. NexThought Monday – The Cash Paradox: Is cash the poor’s best friend – or secret enemy? Advocates for the poor often argue that cash is the most trustworthy payment instrument - especially for the unbanked. And a cash economy would appear to offer them advantages in inclusiveness and convenience. But as Bhaskar Chakravorti describes it, the poor also pay a heavy price for the usage of cash, both in the U.S. and in emerging economies.